I decided to cut today's ride short so that I could take some time to look around Lexington, Virginia. Lexington was named after the famous Revolutionary War battle fought in Lexington, Massachusetts. 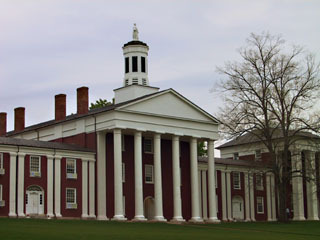 The city is home to both the Virginia Military Institute and Washington and Lee University. Lexington was also home to General Robert E. Lee and General "Stonewall" Jackson, so I spent the afternoon touring sites dedicated to these men. As an individual who grew up in Nevada, the Civil War always seemed to be a part of history that although interesting had no direct influence on the world that I lived in. That is most assuredly not true of the South. 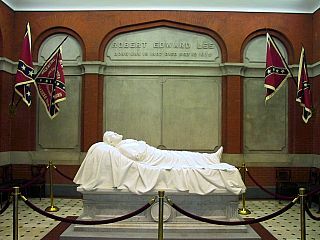 As I have been riding across Virginia I have been seen repeatedly how the people of this State remember and respect their heroes, and although the South may have lost the War Between the States it is clear they still have a deep pride in the men who fought it. After visiting the town I found the Virginia Zeta chapter of Phi Delta Theta, and the brothers took me in for the night without question. After overnighting here, I'll be on my way again in the morning. Enough of the travelogue for now, I'd like to write a little about the riding itself. I realize from some the email I've answered and telephone conversations I've had that I haven't written much about how difficult (or easy) I'm finding things so far. The fact is that I've made a conscious decision to not to focus on anything negative that happens, and there really isn't any reason for me to dwell on difficulties on these web pages. The climbs are starting to get hard, but I do them anyway and I take a lot of breaks. Sometimes I sing to myself to keep a rhythm to my pedaling, and I'm starting to wish I knew more songs. I've got a few aches here and there, but I don't think any of them are too serious and I'll keep an eye on them. I do keep having fantasies about finding a massage therapist who wants to ride for awhile, so perhaps I'll treat myself somewhere after the thousand-mile mark. All of this is outweighed by the positive things I'm experiencing. Virginia is beautiful and I'm seeing a part of the country I've never been in before. I'm traveling at my own pace and I'm free to stop and look at anything that catches my fancy. With my loaded bike I'm a rolling conversation piece and I'm meeting all sorts of wonderful people. In fact, I've already gotten two offers for places to stay in Oregon and one in Missouri. At the pace I’m traveling I should cross in to Kentucky in six to eight days. I’m finding that writing these updates and uploading my pictures is far more time consuming than I had hoped, and I keep thinking about how much weight I could save if I were to ship all these electronics home. On the other hand, I like the idea of keeping this journal and I am enjoying the encouraging messages I have been receiving, so I’m going to persevere in this part of my endeavor and just hope I get more efficient at managing my time and stronger at carrying my load. This sounds like a marvelous trip. Lots of work, but you will have marvelous memories. If your trip detours thru Billings (Huntley) we'll take you in. Alright! You're on the way. Think of me on Friday morning, I'm taking a snocat to the peak of Rose. Planning microwave links to Signal Peak and down to Roseville. It sounds like your able to stay in touch well enough so far. How is the Verizon service treating you? Thanks so much for giving us all these great updates. :-) It helps me to feel like I'm along on the ride, too. Don't mean to tempt you, but we're having a great breakfast of bacon and eggs (yummy), and then Tyler and I will do a little sight seeing on the other end of your route...toward Tillamook. Say, do you remember any of the songs we sang in the canoe? Just wanted to say hi and congratulations on a job well done so far. Just wanted to let you know that I start school on May 20th. So, I guess you can say that we are both on a journey. Well got to go now to finish my coffee, bacon, and eggs so have fun on the rest of your journey. Wow, What an adventure! I have to say that I would totally understand if you decided to dump the electronics. But the updates are great and I always check the site with anticipation of your next great encounter. Not to mention the detailed and eternal log you are creating, people are going to want to read these updates years from now. Nick I think you have always been a positive person. And I have never known you to quit. I have no doubt in my mind that you will arrive in Oregon and behind schedule, only because you will take the time to enjoy the trip. That's what it's all about in the end.